Poet Li-Young Lee speaking with students. The gym fell silent, waiting for poet Li-Young Lee to speak his frst words: “I’m really happy to be here...well, I don’t know if I’m happy to be here, but it’s a crisis for me to be here. Talking to people is a crisis. Writing for me is a crisis. Everything is a crisis.” Li-Young Lee had already intrigued the students: what does a crisis mean and did he just say he wasn’t happy to be here? Nervous laughter spread throughout the bleachers. In time the poet would explain himself and the crowd would warm up to his eccentric but insightful speech. 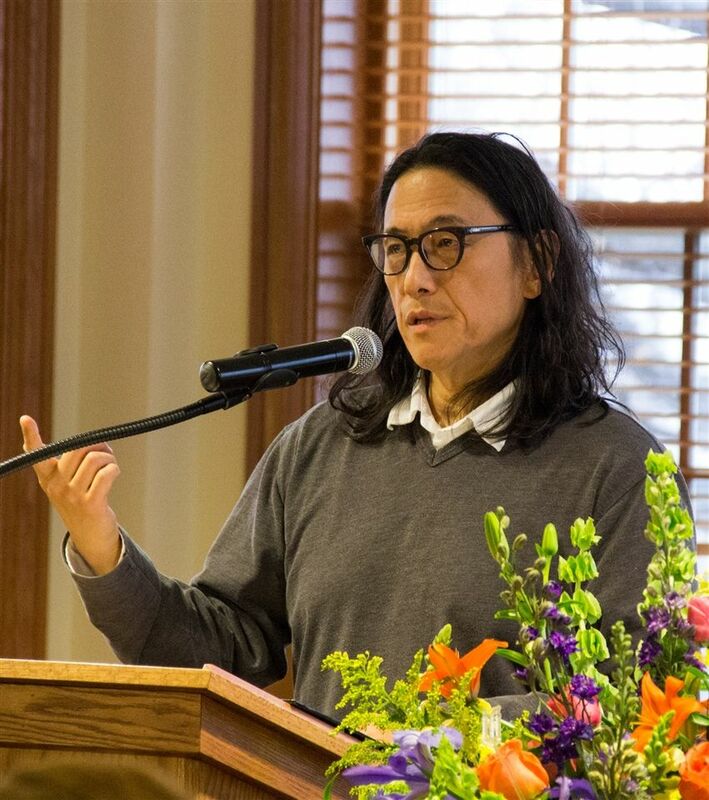 Poet Li-Young Lee, invited by the Celebration of Poetry Committee, came to speak in Assembly on Friday, March 31. He later met with students in the Calarco Library for Q&A sessions. Li-Young Lee spoke in poetry. His natural cadence of speech seemed to have a rhythm that sped up, slowed down, and abruptly ended at times. He would often embark on tangents that seemed to have no end. Even if his logic was not exactly linear, he never failed to end with an intriguing thought. One of Li-Young Lee’s most resounding messages was that poetry is the highest form of martial arts. At frst the message seemed quite odd, since poetry and martial arts appear to have nothing to do with each other, but Li-Young Lee quickly elaborated: “All martial arts are a way to secure safety for yourself...Two things have to be present for others to attack you: they have to feel ill-will and the daring to act on that will.” Li-Young Lee continued to describe the four levels of martial arts: the ability to subdue your opponent, intimidation, invisibility, and fnally the highest level, love. He explained that when someone loves you and wants to exchanges art, food, and ideas with you, then you have secured safety for yourself. Lee made the point that, “the highest thing a poem can embody or communicate is love.” Poetry can create love, and in turn create safety. Li-Young Lee reminded us that interpretations are not merely hypothetical, “Our readings of the world matter, because these get enacted as law.” If harmful ideas are spread and gain popularity, they can be enacted on and cause violence. Head Librarian Faye Prendergast was charmed by Li-Young Lee’s aura of authenticity: “I thought he was a very thoughtful and generous man who offered subtle but strong advice about reading and writing poetry.” His words left a lasting impression on the audience, and many filled the seats of theQ&A sessions. Li-Young Lee was eager to engage in conversation and always made sure that everyone was able to understand his ideas before moving on.